When most people think about saison they are imagining Saison Dupont (pale, moderate gravity, relatively hoppy, peppery yeast) while in fact saison has a huge range, from featherweights like Dupont's 3.5% ABV Avril to a darker 10% ABV beer like Fantôme Spéciale De Noel. In my opinion the only constraint for calling a beer a saison is that it is fermented with a saison yeast strain. After successes with our first two dark winter saisons Alex and I (Noah moved to Colorado a few months ago) decided on a similar plan for the third in the series. This year we opted to add figs (instead of dates or raisins), buckwheat honey, and warming spices (cinnamon and anise). The malt bill was similar to its forebears, but we reduced the original gravity to produce a more drinkable beer. The high lovibond crystal malts will provide some dark fruit character to complement the figs, and the Carafa will add a light roast without causing the dry finished beer to be harsh/acrid. For some body we added steel cut ("Irish") oats to the mash, but not before gelatinizing their starches with a quick boil (a step you can skip when using oats that have been rolled or flaked). For additional fermentables we added buckwheat honey, the darkest most flavorful varietal we could get our hands on. After smelling the musty honey (not too far off of dark LME) we cut back the amount to lend a rich earthiness (hopefully without letting it get too funky). When Nathan and I were brewing with Terry at Bullfrog Brewing he mentioned that he used a small amount of buckwheat honey (~3%) in his 2008 GABF Gold Winning Beekeeper (a sour barrel aged saison) along with a more substantial addition of a milder honey (~7%), I've been looking for an excuse to play with the ingredient ever since. A small amount of bitterness was all we asked from a single addition of Simcoe hops. In a big complex beer the hop variety is of little import, so I used up the last of my 2007 "hop crisis" order. Fermentation was ably carried out by the yeast cake from the Petite Funky Saison I'd brewed a few weeks earlier (with added dregs from a couple commercial sours). So far this has been a great yearly tradition that I'm hoping we'll be able to continue for a few more falls before we get bored of the dark fruit saison concept. 1.25 oz. Simcoe (Whole, 11.00% AA) @ 70 min. 1.00 Whirlfloc @ 10 min. 2.00 gm Anise @ 5 min. 1.00 gm Star Anise @ 5 min. 0.50 gm Cinnamon @ 5 min. Chalk and baking soda added to the mash to make sure the pH doesn't go too low. Oats were steel cut and boiled for 15 minutes to hydrate/gelatinize before adding to the mash about 10 minutes dough-in. Batch sparged with 180 degree water. Hops ~3 years old, adjusted down from 13.6% AA. Spices ground in a coffee grinder for 10 seconds before adding. Half Black Mission figs, half Canadian. Both organic from the CO-OP. De-stemmed, and halved. Boiled in the the final runnings for 15 minutes, then pureed with a stick blender. Added with 10 minutes left in the boil. 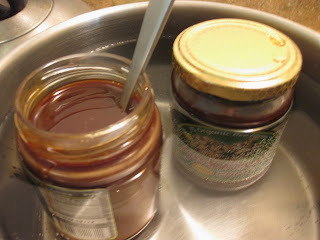 Organic buckwheat honey warmed in a pot of water to loosen, then added after the end of the boil (2 minutes into chilling). Chilled to 72, then pitched half yeast cake from Bretted Saison (along with dregs from Supplication and Consecration). Shook to aerate. Fermented for 10 days on a heating pad set to low to try to keep the fermentation temp above the ambient ~63 degrees. 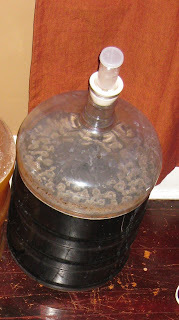 12/14/10 Racked to secondary with .75 oz of dark rum soaked American oak cubes. 10/15/11 Blended some, and bottled the remaining 2.25 gallons with - 1 5/8 oz cane sugar. 5/3/12 Tastes great, although the carbonation isn't quite as strong as it could have been.The buckwheat honey softened out nicely from some earlier samples. Questions about dregs - How do you store them? How long are they considered viable? Local breweries have expressed willingness to share their yeast cakes, how long do you think those would hold up? Thanks! Your blog definitely inspires me to brew, hoping to do my first batch this month! You can store dregs in some fresh starter wort in the fridge for a few weeks without issue. I tend to just dump them into fermenting as I get them unless I have a plan to brew a sour soon. For clean yeast from a brewery I wouldn’t go over a couple weeks, mixed with trub autolysis can set in pretty quickly even in the fridge. I’d suggest coordinating with a brewery to pick up yeast a couple days before brewing, the fresher the better. I have a dark winter saison on tap right now! It was similar to my dubbel recipe with pilsner, munich, caramunich and a nice big additon of special B. I used Wyeast 3711 and fermented from 1.064 to about 1.010. Nice dark fruits and maltiness with just a hint of clove and lots of white pepper notes! I really love playing with the 3711 and expanding the saison horizon. With pitching dregs do you let it sit awhile or do you just want a hint of funkiness? I am planning another saison with brett dregs soon, but wondering how long to give it? I am planning on letting this beer sit until it is as sour/funky as it is going to get. I just bottled half of last year's dark saison, and the other half is still sitting on red wine grapes. Bottling too soon risks over-carbonation (and me drinking it before it is ready). Sounds interesting. I really like the taste profile from using both WLP565 and WLP645. I made a brown Saison this past summer using those yeasts and the bottles still taste great. Grist was mostly Vienna malt and a little bit of oats. Why did you ferment the beer so cold? Will the characteristic peppery notes become apparent at that temperature? I believe the ferm temp were in the mid-high 70s with the heating pad (63 was just the ambient). Probably not as much complex spice, but in a big beer like this I’m not as concerned. I would have gone higher if I could have, but in the winter my options for fermentation temps are limited. i have a tip on the fermentation temps in the winter.... it's um, how would one say..... "rustic"? My concern with a radiator is whether the on/off cycles would cause the temp of the wort to rise/fall too much. Insulating it and helping with the constant heat of a heating pad is a good idea. I did a strong dark last year on the radiator (in my brew kettle, it seemed to work but the beer ended up a bit fusely. Question about the funky: What if I added the roeselare blend along with 3711 to a big saison like this? Would it be a viable alternative to adding dregs? Also, I'm wondering how you formulate the grain bill on these on these. Is there a strategy for the specialty grains' interaction with the bugs? You certainly could add Roeselare,but it will be a milder sourness/funk. Although the Dupont strain is a good choice since it will leave more gravity for the Roeselare to do its thing than something like 3711. The bugs will eat though most of the sweetness, so you don't want to make the beer too roasty. Other than that the bugs don't really affect the character of the specialty malts. Having some raw grain is nice to add come body that can't be fermented out. Have you tried any of these dark saisons without souring? I am curious to try later in the season and am not set up with extra equipment to sour. For our first dark saison we only soured a small part of the batch. However, we liked the soured portion so much that we decided to sour the entire thing for batches 2/3. Just pulled a sample of this last night, it has come around but the earthy buckwheat honey character is still a bit stronger than I would like. No issue at all. For most varietals of honey I actually like to wait until after primary fermentation to preserve more of the delicate floral aroma, but buckwheat is so pungently aromatic that it can be added earlier. I would gently stir it in to make sure it dissolves, the yeast will take it from there. Good luck, hope it turns out well! 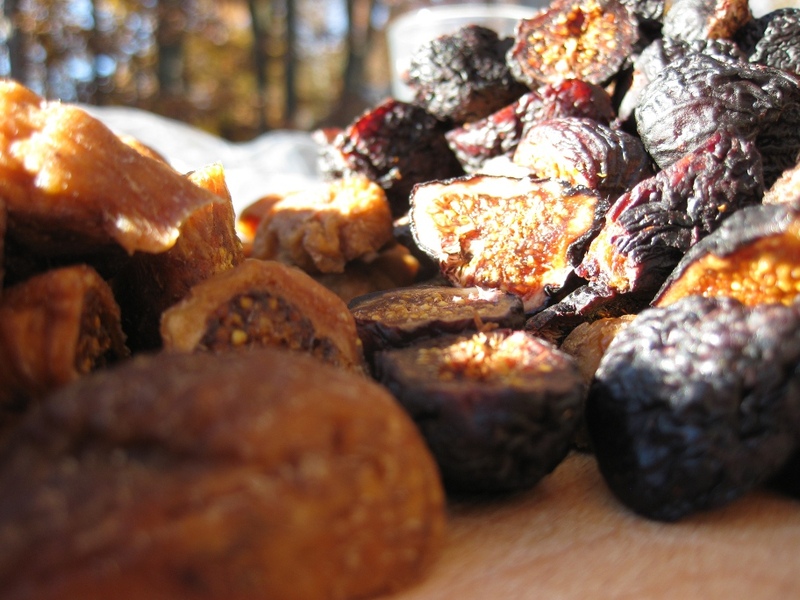 Did you use fresh or dried figs? That is the figs in the first picture, both types were dried. Really enjoy your posts and adventures... Very inspiring! I have brewed a couple of sours now after reading your site and they've been great! As for figs, can I ask why you boiled them? I find a lot of mixed advice on boiling fruit prior to fermentation.. I have a prolific fig tree in my yard getting ready to fruit, so I'm planning a Belgian Dark with figs... The fresh figs have a fair amount of sap oozing out the top...wondering if I should boil them, or just freeze them? I usually don't pre-boil my fruit because it drives off aromatics (most people do it to sanitize). In this case we wanted to puree the dried figs to get a quick infusion in the wort, rather than deal with them later. With dried fruit most of those fresh aromatics are gone already, so heat doesn't hurt them as much as it does fresh fruit. For fresh fruit I generally just freeze and then vacuum bag them until I am ready to use them. Noticed this was racked to the secondary in December then bottled the next October. Is it really fermenting for 10 months? Yep. A sour beer like this with a mixed-fermentation including lactic acid bacteria and Brettanomyces can require anywhere from 3 to 36 months before it is ready to bottle. Bottling too early could result in the production of excess carbonation in the bottle. If you did a clean fermentation with just saison yeast you could bottle much sooner, but the flavor wouldn't be nearly as interesting! I had a problem with super carbonation in a Saison with wlp 565. OG 1058 FG 1010. The problem was too much sugar in the priming. I thought that had more beer to bottle so used 8.5g of sugar/liters (should use 7g/l). The head of this beer was very beautifull, Duvel like. Then 4 months after I still had some bottles and all gush when opened. I made 3 Saisons after this one. I let the FG goes lower (1002) and carbonate with less primimng sugar (6g/l)because I afraid of the super carbonation. The fist one took one month to carbonate well but still do not have the same head I had with the first Saison. I think it is a little bit thin. Maybe a little bit more carbonation could give a better mouthfeel. The second one was a Strong Saison with OG 1077, FG 1002, same carbonation profile. Two weeks in the bottles and the carbonation still very low, mainly for a Saison. Same problem with mouthfeel. I will wait another 2 weeks to check out the carbonation again. I can do the priming again if necessary. The last Saison is a Brett Saison. Og 1059, let it dry to 1010 and pitch Brett Brux from WL. Let in a bucket for the last 3 months. I can see the pelicle on top, the beer is very dry, the brett caracter is very soft yet. My goal is to bottle in 6 months total. My concern is again with a low carbonation after the priming. This one probably will be with FG 1000. What do you recomend for these beers? Do you think that a good carbonation could give a better mouthfell? I want a well carbonated Saison (I like it in the style) but dont want supercarbonation or even a bottle bombs. I am planning to not dry too much the Saison, 1005 to 1007, and raise a little bit the priming sugar to 7 to 7.5g (invert cane suggar)/liters. Do you think this will help with the body perception? If not what do you recomend? What about the Brett ones? I have to let it dry well to 1002 or less. What carbonation profile do you recomend for this one? For every beer you should allow the yeast to dry it out as much as it wants to in the bottle. For that first saison, if it continued to get more carbonated, the issue was bottling too early, not too much priming sugar. A drop of .003 is all it takes for full carbonation, so if you add priming sugar and it drops just a little you can have gushers. A bit more carbonation can help a thin mouthfeel, but there are other things to consider for next time. Mash hotter to prevent the yeast from drying the beer out so much. Add grains with lots of protein and/or beta glucan (rye, wheat, oats etc.) these will enhance the body without adding sweetness. Thank you very much Mike. I`m using 15 to 20% of wheat malt in the grist and 10 to 15% of cane sugar to the total gravity in all of the 3 Saisons. I will mash at higher temperature. I was mashing at 144F.